Three Dimensional Printing (3DP) technology was developed at the Massachusetts Institute of Technology and licensed to several corporations. An inkjet print head moves across a bed of powder, selectively depositing a liquid binding material. A thin layer of powder is spread across the completed section and the process is repeated with each layer adhering the the last. Material options, which include metal or ceramic powders, are somewhat limited but are inexpensive relative to other additive processes. 3D Printing offers the advantage of fast build speeds, typically 2-4 layers per minute. 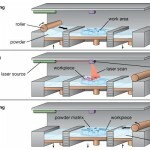 However, the accuracy, surface finish, and part strength are not quite as good as some other additive processes. 3D Printing is typically used for the rapid prototyping of conceptual models (limited functional testing is possible). The 3D printing process begins with the powder supply being raised by a piston and a leveling roller distributing a thin layer of powder to the top of the build chamber. A multi-channel ink-jet print head then deposits a liquid adhesive to targeted regions of the powder bed. These regions of powder are bonded together by the adhesive and form one layer of the part. The remaining free standing powder supports the part during the build. After a layer is built, the build platform is lowered and a new layer of powder added, leveled, and the printing repeated. After the part is completed, the loose supporting powder can be brushed away and the part removed. 3D printed parts are typically infiltrated with a sealant to improve strength and surface finish.